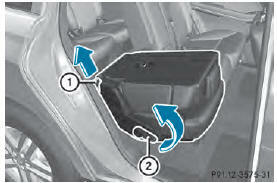 If the seat and backrest are not engaged, they can fold forwards, e.g. in the event of sudden braking or an accident. • This will cause the vehicle occupants to be forced into the seat belt by a seat or backrest which is not engaged. The seat belt can no longer offer the intended level of protection and could even cause injuries. • A child restraint system would no longer be anchored or positioned correctly and would not be able to perform its required function. • The seat backrests cannot restrain objects or loads in the cargo compartment. There is an increased risk of injury. The seat does not engage in the entry/exit position. The seat could fold back suddenly, e.g. when accelerating, braking, changing direction suddenly or in the event of an accident. Persons in the sweep of the seat could become trapped. There is a risk of injury. Always fold back a seat which has been folded forwards before you pull away. Make sure that the seat and backrest engage fully. Children could become trapped if they adjust the seats, particularly when unattended. When leaving the vehicle, always take the SmartKey with you and lock the vehicle. Never leave children unsupervised in the vehicle. When you adjust a seat, you or other vehicle occupants could become trapped, e.g. on the seat guide rail. There is a risk of injury. Make sure when adjusting a seat that no one has any body parts in the sweep of the seat. You can adjust the angle of the backrests in the second row of seats. There are ten detent positions to choose from. ■ Pull the left or right release lever 2 upwards in the direction of the arrow until the relevant backrest 1 is fully released. ■ Pull the backrest 1 forwards in the direction of the arrow and allow it to engage. ■ To ensure that the backrest has engaged, lean firmly against backrest 1. Make sure that there is nothing on the folded-down seats in the cargo compartment. The cargo compartment must be empty for the third row of seats to be folded up. 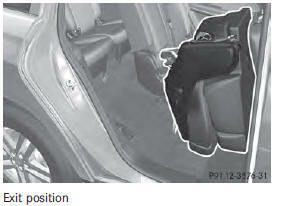 The seats or the objects in the cargo compartment could otherwise be damaged. Make sure that the seats in the third row are empty and not blocked before folding them down. The 3rd row of seats consists of two electrically foldable individual seats, which can be lowered into the cargo compartment. If the seat is not correctly locked in position, the display message: 3rd Seat Row, Right Not Locked appears in the multifunction display. If you fold the seat back until it engages, the display message disappears. Pull the backrest firmly to ensure that it is fully engaged. The switches for folding the left or right-hand seats up and down are marked: L for the lefthand seat when viewed in the direction of travel, R for the right-hand seat when viewed in the direction of travel. 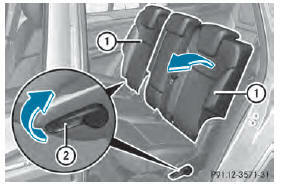 ■ To fold down: fold the right-hand outer seat in the second row of seats forwards . ■ Briefly pull switch 1. ■ To stop the automatic folding: briefly pull switch 1 again. ■ To fold down: briefly press switch :. ■ To stop the automatic folding: briefly press switch : again. ■ Briefly press switch 1. ■ To stop the automatic folding: briefly press switch 1 again. ■ To fold down: briefly pull switch 1. If there are objects underneath the seat, the seat can no longer be folded up or down fully. The seat could be damaged. Only drive with the panel completely installed. 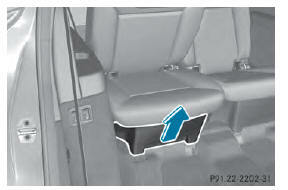 If you drop objects underneath the seats in the 3rd row, you can remove the panel in order to reach beneath the seat. ■ To open: fold the corresponding seat up or down . 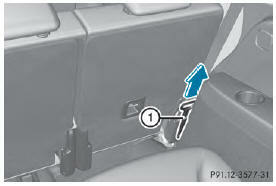 ■ Once the seat is folded halfway up or down, briefly press the button again to stop the automatic movement. ■ Grasp the panel recess. ■ Pull the panel in the direction of the arrow and remove it. ■ To close: fold the corresponding seat up or down . ■ Attach the panel using the guide pins. ■ Push the panel downwards until it engages. ■ Fold the seat up and down fully to check that the panel is seated correctly. To enter or exit the 3rd row of seats: the outer left and right seats of the 2nd row can be folded down. One of the outer seats of the 2nd row is in the entry/exit position: the multifunction display shows, e.g. the 2nd Seat Row, Right Not Locked display message. The release handle for the EASY-ENTRY/EXIT feature is located on the entry side on the back of each outer seat in the 2nd row of seats. ■ Move the head restraint to the lowest position . ■ Pull release handle ; in the direction of the arrow to the pressure point and hold it in this position. You have two options for folding the seat down fully. ■ Pull release handle ; again in the direction of the arrow to the pressure point and hold it in this position. ■ Pull on release loop : in the direction of the arrow and hold in this position. ■ Lift up the seat until it folds forwards. Vehicles with memory function: The corresponding front seat moves slightly forwards. If you wish to exit the 3rd row of seats, fold down the outer seat on the right-hand side as follows. The release loop for the EASY-ENTRY/EXIT feature is located at the bottom on the back of each outer seat in the 2nd row. ■ Pull on release loop 1 in the direction of the arrow and hold in this position. ■ Pull on release loop 1 again in the direction of the arrow and hold in this position. Vehicles with memory function: Call up the programmed seat setting using the memory buttons in order to return the front seat to the saved position. ■ To lock the seat: fold back the seat until it engages. ■ Fold back the backrest until it engages. To enter or exit the 3rd row of seats: the outer left and right seats of the 2nd row can be folded down electrically. 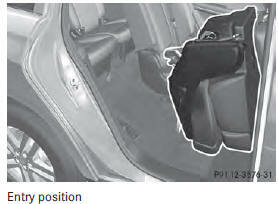 The seats can be folded down electrically if the vehicle is stationary and the respective rear door is open. The head restraint retracts, the backrest folds forwards and the seat folds forwards. The seat can be manually returned to its initial position. You can set the multicontour seat using COMAND. See the separate COMAND Operating Instructions. You can adjust the contour of the front seat backrests individually to provide optimum support for your back.